Video clip synopsis – In an Indian call centre, graduates, keen for employment, learn how to communicate globally with diverse clients from the USA, Australia and the UK. Broadband MP4 callcent_bb.mp4 (14.0MB), suitable for iPods and computer downloads. The video clip explores the attractions and stresses of the call centre jobs, the training methods and requirements, and the views of customers and unionists in Australia. It introduces warm, young Indian graduates aspiring towards employment in call centres. It demonstrates globalisation issues and the need for intercultural understanding. A number of ethical issues are raised, including the re-shaping of one’s identity for the needs of an employer. 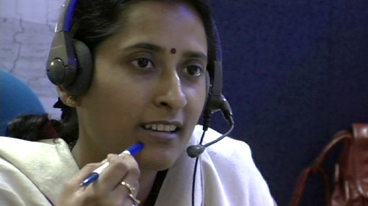 In a 21st century call centre, India is an excerpt from the documentary Diverted to Delhi produced in 2002. Diverted to Delhi is a Greg Stitt Production, developed in association with the Australian Film Commission and financed with the assistance of the Australian Film Finance Corporation. Produced with the assistance of the Australian Broadcasting Corporation. In the video clip’s introduction the narrator tells us that ‘In this era of globalisation it’s common for customer queries to be re-routed through India….’. Draw up three columns to list the cities, images and activities that the director presents to depict globalisation. What is an ‘Anglicised name and accent’? Did you know that there are many varieties of English? Can you find out how many exist in the world today? Begin by looking up ‘Standard English’ and ‘Singlish’. It may be useful to know that the Australian accent has historically been looked down upon by the British. Do you think that one variety is better than another? Why? The documentary narrator explains that the call centre workers in India are taught to ‘speak and think like their customers’. Is this peculiar to Indian training or can you think of employers in Australia who train workers similarly? Consider bank teller training and student casual workplaces like McDonalds. What are the similarities and differences? The call centre trainees explain their preconceptions of Australians in class. What do they mention? Are these accurate? What is your knowledge or preconceptions of Indians? What are your sources of information and/or experience? What is a stereotype? Do the trainers appear to be passing on stereotypes to their students? How do they inform themselves? The trainees speak English as a second, third or fourth language. How many languages do you speak? Do you feel Australians should learn to speak another language? Why? Who enrols in the call centre courses in India? Why? What are the attractions and requirements? What reasons do Margan, Surender, Gunjan and Vineet give for wanting to become call centre employees? The crash course English trainees laugh at their mistakes in class. Do these scenes remind you of your LOTE classes at school? What is the difference between formal and informal conversation when learning another language? If you have travelled out of Australia, have you found that people have had difficulty understanding your informal language and accent? Give examples. According to the narrator, why is India’s call centre industry growing? Do you think that it is likely to continue growing in the world economic downturn? Why/why not?